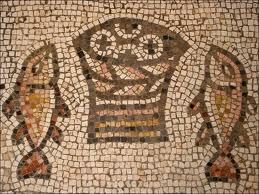 What happened with Jesus and those five loaves and two fish and the thousands of people to be fed? Neighborliness happened. The "kin-dom" of god – a.k.a. public life reorganized toward neighborliness – happened. A crowd of people had gathered to hear Jesus teach. They had secreted away for their own use food for themselves. Under the influence of this remarkable teacher, they began to open up, began to sense the intrinsic abundance of the life they breathed, and the universe in which they swam. From that sense of boundless provision welled up an urge to share of this manifest plenty. From the bottoms of bags and folds of clothes came forth food to share. From the divinity within them, the divinity that is always there, lying too-often unnoticed, came forth this food. It came from God, which we call by many names, one of them being neighborliness. Parker Palmer was once a passenger on a plane that pulled away from the gate, taxied to a corner of the tarmac, and stopped. Unitarian Universalists know that story too. We Unitarian Universalists have fashioned a wiser understanding of the miraculous. The uninterrupted causal nexus of history and nature is replete with the miracle of community – the miracle of abundance. This is part 5 of 5 of "Myths of Scarcity"
Previous: Part 4: "Fabricating Scarcity"